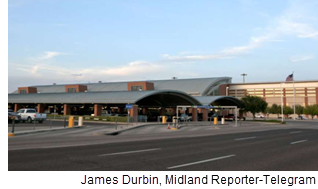 ​​​​​​​​​ MIDLAND – Midland International saw a 15.2 percent increase in people boarding airplanes over the year in November 2018, according to airport officials. The report showed 54,503 people boarded an airplane at the airport. That was an increase of over 7,000 passengers from November 2017. The total was also more than 10,000 greater than November 2014 and more than 20,000 greater than November 2009. The month that saw the highest number of boarders in 2018 was June at 54,747 people.